Angel's Creative World: Honey Bee Stamps New Release Blog Hop! Hi all! It's FINALLY here! 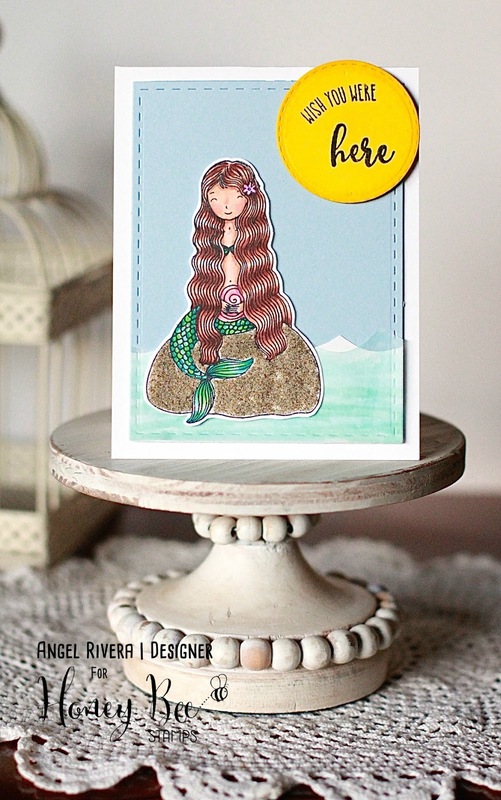 Welcome to the Honey Bee Stamps Blog Swim! It's an ocean-themed release so yes, we're having a swim, not a hop! Everything is available for purchase Now in our shop HERE. And we're going to Shellabrate with some sweet prizes! ;) TWO lucky winners will each receive a $50 gift certificate to the Honey Bee store! All you have to do is comment on the Honey Bee stamps Blog, as well as all of the other designers, by July 16th. Winners will be announced July 17th at Noon PST. The fun gets started on the Honey Bee Blog HERE! My first card features the lovely Mermaid Song stamp set. I love that this image is so big. This card measures about 4 1/2 x 4 1/2, to give you an idea. I stamped it on watercolor paper then used my Zig Clean Color Real Brush Pens to color everything in. I added the Hello dies (cut out with Blu Raspberry and Smooth White card stocks) without trying to cover up too much of the image. For my second card, I used the sweet Ocean Bliss stamp set. I colored the mermaid with Copics then covered the rock with Desert Oasis Sand. I love the texture the sand adds to the finished card! The 'waves' were hand cut from vellum and white card stock. I used Copics on the backside of the vellum to color in the waves. I also curved the 'Wish you were' part of the sentiment to go with the curve of my 'sun'. Next up on the Blog Swim is Bibi! Remember to comment along the way for your chance to WIN! I just love these mermaids! I like how you colored the hair. Adorable cards Angel!! This release is just so sweet. I love what you have created with these new stamp sets. I love all the special details on your second card!! Love the layered from the water and also the sand on your rock!! I'd have never thought to do that on the rock, but it's amazing. Super cute card ideas. Thanks for the inspiration. So many mermaids! Le Sigh! Both cards are wonderful. Their clean and simple but very beautiful!! Wish I could do hair like you. These girls are beautiful! Pretty cards! Thank you for sharing them with us! Very cute cards! Love the colors on your first one. This is such a fun release and your cards are so cute. Love the colors. Thanks for sharing. They are do very cute, I just love them! Wonderful card. The mermaid is so cute. 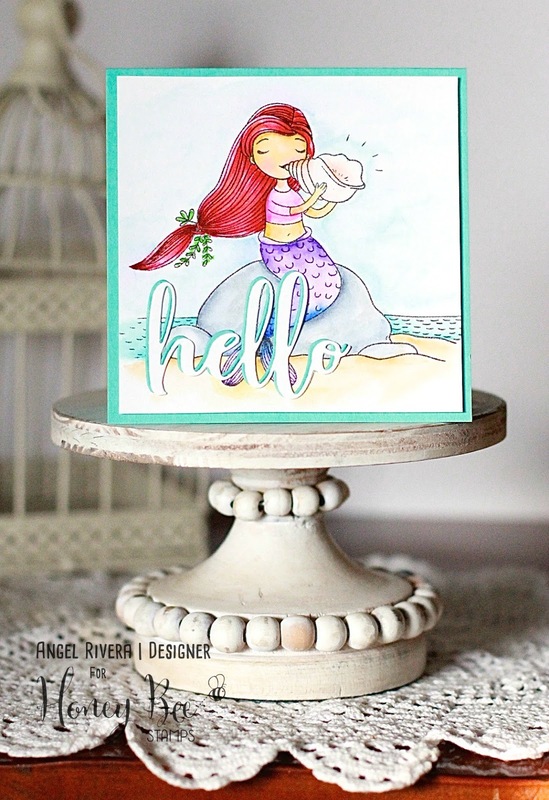 Very cute, love the image of the mermaid blowing on the shell and the colors you used! Thanks for sharing. Cute cards! What beautiful cards. The sand embellishment is amazing. It adds such wonderful texture. Your first card is so fresh! Cute! What beautiful mermaids Honey Bee has come out with!! Gorgeous cards!! What beautiful mermaids that honeybee has come out with for the July release. Gorgeous cards!! Beautiful cards! Those stamps are stunning! Two delightful takes on the mermaids in this set. Thanks for sharing them. I am loving these darling mermaids! These mermaids look really fun to color! Lovely cards! These mermaids are gorgeous! Love your mermaid card. Honey Bee stamps and dies are very different from other stamp lines. They are always so creative and different and the new release is no exception. Lovely. Would like to have them all but Bliss is my favorite mermaid. Thanks for sharing your art. Lovely cards, thank you for sharing. I love your cards. The highlights in the second mermaids hair makes it really look glossy. The first little mermaid just looks so happy. Really cute cards! Love the colors and design. I am lovin' these cards - so pretty! Your cards are adorable! These mermaids are just so sweet! I like the clean and simple design, but yet the vivid red hair! Very nicely done! I haven't really been interested in the mermaid craze, but this release makes me want it all! Such pretty cards! I love these adorable mermaids! Beautiful coloring on your cards! I am loving the coloring of each mermaid by each blogger. Love them all. I love your red-headed metmaid card! She is so cute blowing on that conch shell! your mermaids are adorable! I love the colors! These are so cute, great job! This release was mer-made for me. I love your cards. Lovely cards. I'm fascinated with the hair color. The entire release this month is so magical. You created two wonderful cards that are filled with inspiration. love the rock texture on the second card! Thanks so much for these. Your cards are so beautiful! I love the mermaids on both of them. I think the mermaid with the shell is my favorite! So pretty! WOW Angel, your cards are fantastic. This is a great hop and I am really enjoying it! Love the hair on your mermaids! Your cards are lovely! The coloring is beautiful! Thank you for sharing! Wouldn't it be nice to have such beautiful hair? Love your color choices on both cards. Thanks. Love the colors! Thank you for sharing! Very pretty mermaid cards. I like your coloring and the stacked Hello on the first one. Love both colors. Honey Bee has some really nice and unique embellishments! I really like that meditative mermaid with her long waves of hair!! Pretty cards! Love mermaids! Was sitting on the fence for this set (I have a lot of mermaid sets already), but now I think I got to have it! Beautiful, I love the texture the sand adds! Both so beautiful! And love the sand... need to check that out! Really very lovely cards! Beautiful job coloring both of your mermaids! They are both beautiful! Really sweet cards, that stone looks totally real! I love the dimension you gave to your "Hello" sentiment ! Fabulous cards!! Love how you used sand!! Really sweet cards. Those mermaids are so pretty. Nice cards! The sand on the rock looked very dimensional. Thanks for the opportunity to win. Angel, your mermaid cards are just gorgeous!!! I'm loving this new release!